A message posted inside the Kosciusko County Justice Building. 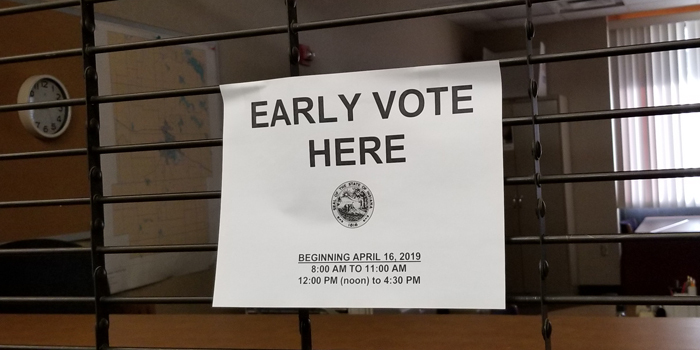 WARSAW — In-office early voting begins Tuesday, April 16, at the Kosciusko County Justice Building, 121 N. Lake St., Warsaw. Hours are 8 to 11 a.m. and noon to 4:30 p.m. Monday through Friday at the Justice Building. On May 6 — the day before election day — early voting will be available from 8 a.m. to noon. Early voting will also be available on two Saturdays — from 8 a.m. to noon on April 27 and May 4. Anyone with questions can call the county clerk’s office at (574) 372-2331.